A model of the Boeing Airpower Teaming System. The U.S. manufacturer hopes to sell the multi-role aircraft, which is 38 feet long (11.6 metres) and has a 2,000 nautical mile (3,704 kilometre) range, to customers around the world, modifying it as requested. 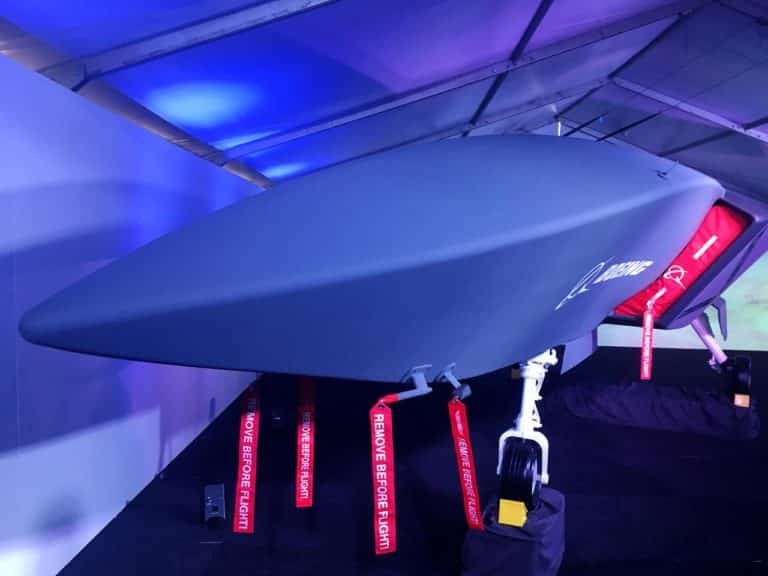 The prototype is Australia’s first domestically developed combat aircraft since World War II and Boeing’s biggest investment in unmanned systems outside the United States, although the company declined to specify the dollar amount. The Australian government is investing A$40 million (22 million pounds) in the prototype programme due to its “enormous capability for exports,” Minister for Defence Christopher Pyne told reporters at the Australian International Airshow. Defence contractors are investing increasingly in autonomous technology as militaries around the world look for a cheaper and safer way to maximise their resources. Boeing rivals like Lockheed Martin Corp and Kratos Defence and Security Solutions Inc are also investing in such aircraft. In addition to performing like a fighter jet, other roles for the Boeing system include electronic warfare, intelligence, surveillance and reconnaissance alongside aircraft like the P-8 Poseidon and E-7 Wedgetail, said Kristin Robertson, vice president and general manager of Boeing Autonomous Systems. The Boeing Airpower Teaming System will be manufactured in Australia, but production lines could be set up in other countries depending on sales, Arnott said.